Creating a mental map of your surroundings is deep rooted in our dna. It’s something we all do. Back in our caveman days, we had to be able to find our way from the river back home to the cave. We most likely did this by recognizing and locating natural things, like trees, the sun, and rocks. Perhaps we used sticks to point the way or we followed a stream. But as beings with highly developed vision, we relied on our eyesight, as we do today. Since I’ve lived in four major cities this year, with very different urban plans (or lack of planning), I’ve found it’s best to get the lay of the land quickly. This helps me maximize my time in each place as a “local.” Plus, I get great satisfaction in being able to find my way around like a local. The best kick is when someone asks me for directions! To better understand my process, I recorded my mental maps over time in Barcelona, Dublin and Amsterdam. As this year progressed, I found I’m not the only person who is interested in recording how they interpret or map their surroundings. 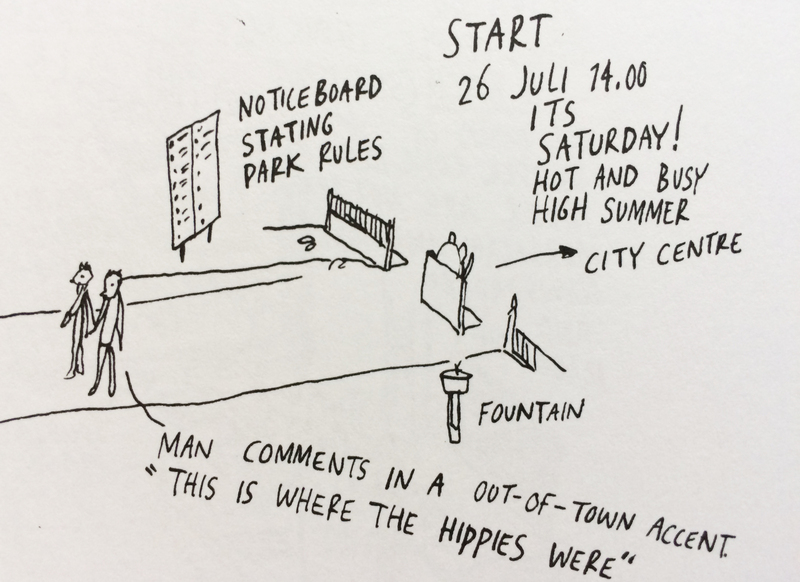 A few weeks ago, I met with Jan Rothuizen, an artist in Amsterdam who creates hand drawn maps and illustrations. As you study his work, you realize he isn’t drawing maps so much as he is recording a memory. He’ll “map” a room or make a “map” with streets, drawing and writing down everything that catches his eye. He records not only what something looks like, but also what is happening around the item, such as things that were said, or particular colors, smells, and how long he stayed to collect the information to make the drawing. Each drawing could be a depiction of a mental map, with all of the information one collects, consciously or subconsciously. His work involves quite a bit of text about a place. I found a correlation between what he was doing and how Lynch describes mental mapping. I’m fascinated by the subject of mental maps, so I decided to look into it a little deeper. There are many academic writings about mental mapping, or cognitive mapping, that you’ll find in a Google search. 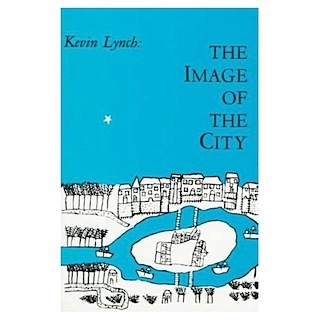 After some digging, I found a very interesting book, The Image of the City, Kevin Lynch, 1960. Lynch went to three cities, Boston, Jersey City, NJ and Los Angeles. He and his team spoke with a small sample of people from each city and asked them to “map” their journeys within the city. 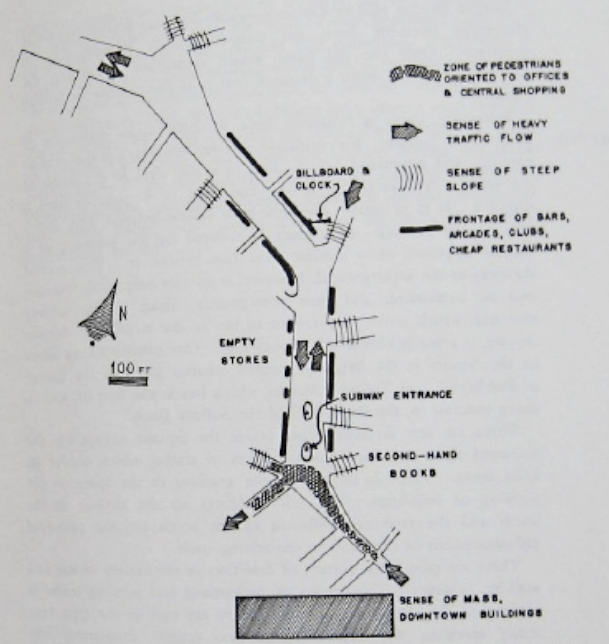 He had them draw maps and also describe how they would get from one place to another, giving details about landmarks, streets, shops and general information about an area, for instance, is this area congested? Is it easy to get across this street, do you think area A is connected to area B? He also asked them about social aspects of places – is this a commercial area? What happens here? From this research, he and his team came up with five different attributes for discussing mental navigation and wayfinding. He further explains how the “imageability” of a city, or how well someone can visually recall aspects of a place, affects their mental maps. High imageability, with a lot of distinct features and areas, helps with navigation. Low imageability results in poor orientation and confusing navigation. This book was written 50 years ago and has been a seminal text for city planners and architects for years, so it was a good place to start for me. Others have used this book as a basis for further examination. Recently, Barbara Tversky questions the use of the term “cognitive map.” She refers to this collection of spatial data as a “cognitive collage,” expanding the concept beyond streets, landmarks and pathways. She concludes our personal understanding of a space and our ability to navigate within it is much more complex and includes memories, such as events that happened there, or what we have heard or learned about a place (indirect experience) and other environmental knowledge. It’s an expansive subject, but for this post, I’ll stick with the basics laid down by Lynch in 1960. Five attributes of mental maps. Lynch broke down the maps people made for him into five different attributes: 1) Paths: These are your routine routes that you repeatedly take; 2) Edges: These are the natural or man made linear breaks along travel, such as a river or railroad, that might stop the flow of travel; 3) Districts: These are conceptual areas with common identifying characteristics, like a shopping area, a sprawling college campus or a neighborhood with similar styles of architecture. Districts can be entered and left. ; 4) Nodes: These are the junctions or intersections you encounter, where a change in direction may occur or where a decision must be made of where to go next. Again, nodes can be physical or conceptual anchor points; and 5) Landmarks: We all have our unique set of landmarks. These are items that can be identified from your view that you rely upon for navigation. This attribute, along with the idea of a path is the easiest to identify. Add to this that each element one chooses for their mental map is imbued with a personalized identity, structure and meaning. You “map” what is important to you (much like Rothuizen does). It’s important to note your mental map may not correspond to a paper map of the place, but it probably is sequentially correct. All together, these attributes allow you to move from one place to another with confidence and security. Since I love looking at maps, before I arrive, I pour over paper maps of the city for an overview. I get a general idea of geography and streets of the city. I locate the city center, along with my apartment, major parks, bodies of water and train stations. These things will become my mental map edges and nodes. I examine the street grid, to see if it will help with navigating. Some cities have a strong rational grid, others are just a medieval jumble of streets. Barcelona has a particularly beautiful grid of square residential blocks surrounding its medieval city center. London has well-known neighborhoods that could be considered districts. Amsterdam has a semi-circular layout that can be challenging to navigate at first. Dublin is strongly anchored to both banks of the eastward flowing River Liffey. Each city grid has its own personality, a personality it was my job to become friends with. 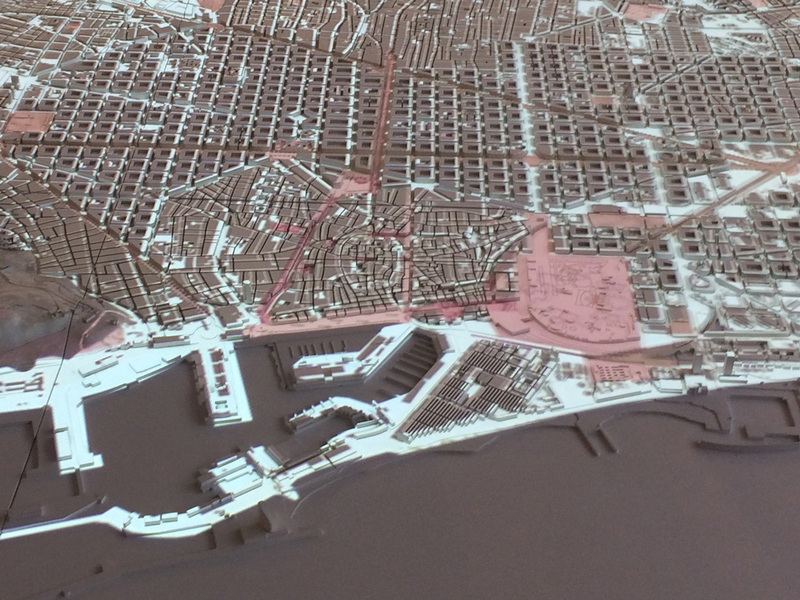 Barcelona’s distinct street grid surrounds the medieval center, as seen in this model of the city. I also use Google Maps and Street View before I get to the city, to understand distances and to get an idea of what the neighborhoods look like, especially around the apartment we rented. Second, find milk for tomorrow morning’s coffee. When my husband and I arrive in a city, the first place we usually go is the grocery store we’ve found in Google maps. It’s a small but very important step, because it establishes a direction toward or away from the city center, in relation to our apartment, and will become one of my main paths. This is the time we start to understand our immediate area and how it relates to the maps we’ve studied. We may see a nice place for coffee, or a hardware store along the way that could come in handy too. I want to quickly understand this path that I know I will take regularly. Third, get out and about! Once the milk, and maybe a ready meal, is in the fridge, next comes tourist-type sightseeing. This moves me out of my immediate neighborhood. To find my way to a museum, I pre-plan at home with Google Maps and/or the City Mapper app (not available in Dublin!) and a paper map for overall orientation. It’s best to walk to the destinations, which helps internalize each route, plus you get to see so much more of the city. I’ve found memorizing the route really doesn’t help during the first few days, until you can differentiate some bits and pieces of what is around you (like those walks to the grocery story). Sometimes you just need to give in and use the phone. My ultimate goal is to be on automatic pilot, but this takes time. We spend hours literally wandering around sightseeing. We go to museums, stores, monuments, and train stations. In later days, we venture to other neighborhoods, mostly to look at architecture. I make meetings with different people across the city. Consciously I try to build my mental map. I purposely look at the surroundings for clues, or landmarks – signs, trees, doorways, and intersections. It’s best if they stand out visually. I try to stick to the same paths most of the time, particularly when moving from one side of the city to the other, even if it takes a little longer. This is a good strategy when biking too, the fewer turns to take, the better. Again, this builds confidence. Eventually, deliberately (as opposed to being lost), we try to take a short cut or explore a new street to fill in the gaps to fortify the map. I do use Google maps and City Mapper apps while on the street. It can be pretty frustrating to constantly be unsure of where you are. I prefer City Mapper because I think it responds quicker to your movement than Google maps, making it a bit more discreet to use. Finding landmarks – not as easy as it seems. You can’t always determine what will be a good landmark from a map. I try to find landmarks that I can see from a distance. When we arrived at this Amsterdam apartment, our host pointed out the window and showed us where Westerkerk, the “big church,” was, as our landmark. Tall landmarks are important, but the problem is, you can’t always see them from other parts of the city. You also need to find smaller things along your route to guide you. The former police building and Westerkerk, Amsterdam. 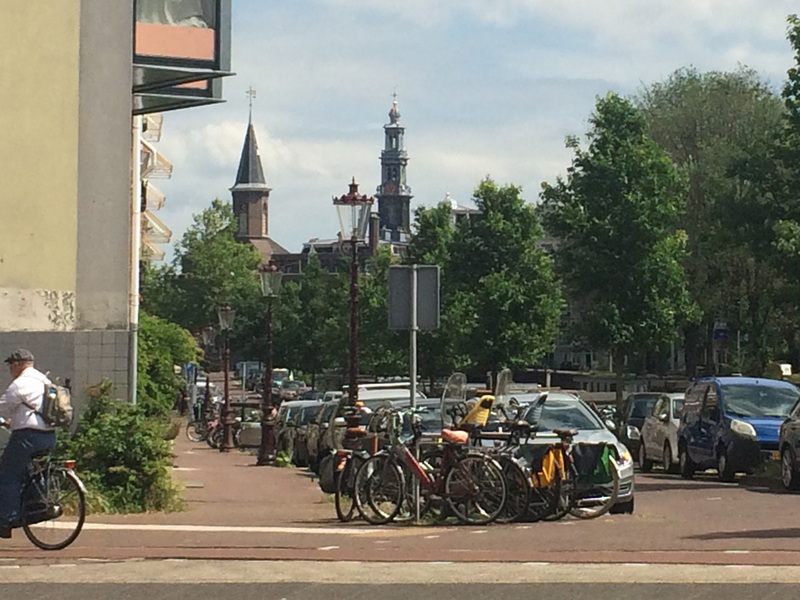 Down the street from us, in the direction of Westerkerk, is an old police building with a pointy tower. When I can see it, I know to head toward it. Just because you recognize a landmark, it doesn’t mean you know what to do once you get to it. After several successful attempts at finding the apartment after a day out, I saw a familiar landmark of Morgan & Mees, a restaurant just around the corner from us. But for some reason on that day, I thought I had to turn the opposite direction. This took me out of my way by about 10 minutes, when the apartment is about three minutes from the restaurant. But we learn from our mistakes (hopefully), and now turning left at Morgan & Mees is cemented in my head. 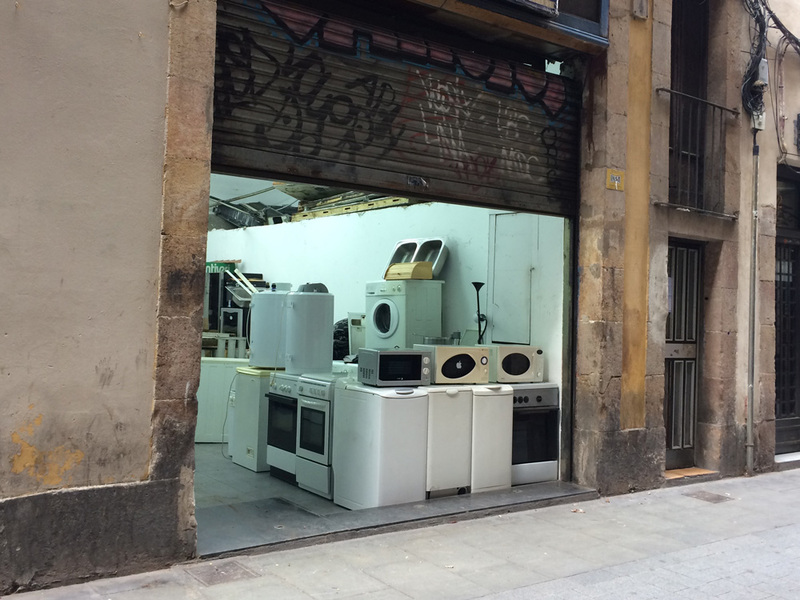 A rather mundane appliance shop in Barcelona says you are almost home. At first landmarks are monumental, like the Anne Frank House in Amsterdam. These common landmarks match your prior knowledge of a place, and they match the tourist map as well. In many parts of the city, there are signs pointing to the Anne Frank House. It’s across the canal from the Tulip and Cheese museums (of course) and in our first few days, I knew if I could get there, I could get home. Later, landmarks become smaller and more local. Soon I could recognize the house that is set back a little from the street or the restaurant that is kind of creamy colored with the hand written menu outside. Colorful construction netting on buildings is a great landmark, because it is so different from the building materials and really stands out. (My niece pointed out that the netting is IKEA blue and yellow, so she would “turn at IKEA”) Soon you begin to recognize smaller things on your path, like shops, sculptures or fancy building doors that signal where you are. These things make your journey familiar and comfortable. After more time, you do not consciously look for or think of these small landmarks at all. 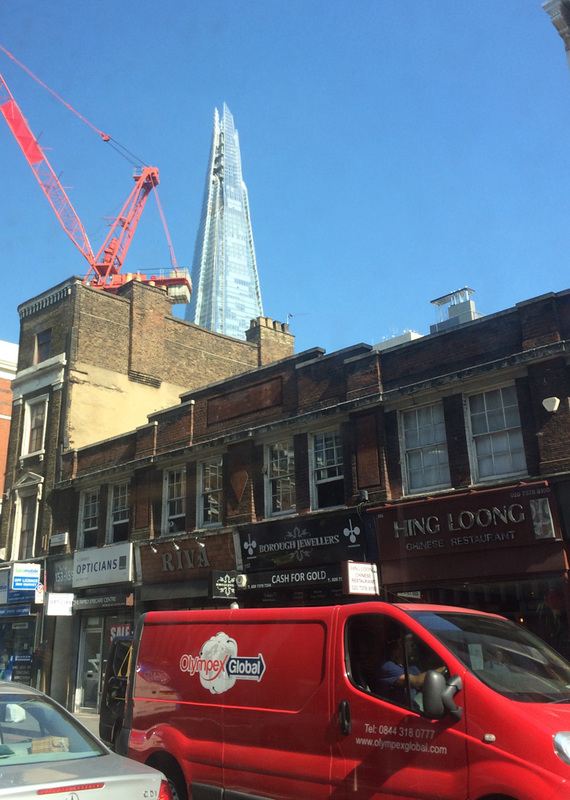 The Shard in London proved to be a tricky landmark. Sometimes it just didn’t align with where you thought it should be. 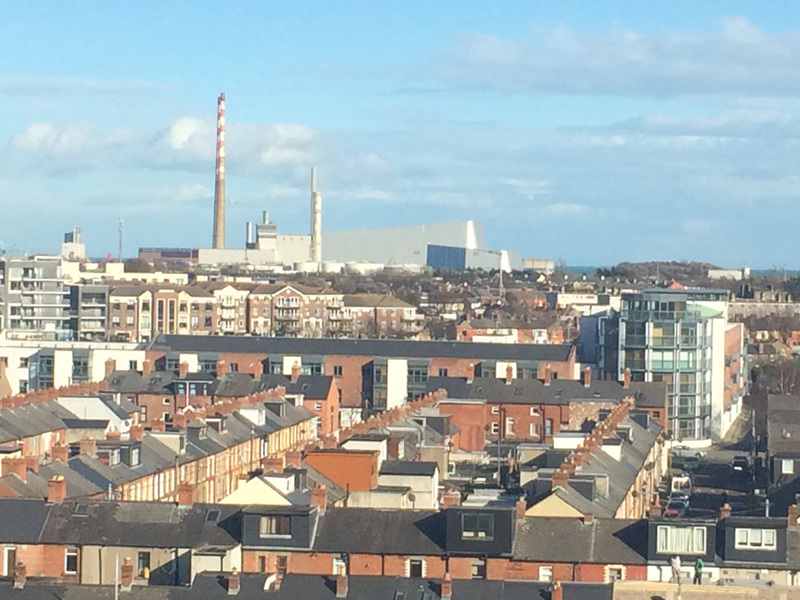 The red and white Poolbeg stacks in Dublin were reliable. They were always to the east! Lastly, not all streets are signed. European cities tend to use a plaque on a building instead of a freestanding street name sign. Dublin had a lot of new buildings where the street names had not been installed. Until you start to recognize where you are, if you are constantly looking at your phone, then trying to find a street name sign, you are in danger of getting hit by a car, or by a bike in Amsterdam. I do try to pick up a tourist map that has pertinent information – major buildings, named neighborhoods and shopping areas, along with tourist attractions. These are the things that help define the districts and edges of the city. Tourist maps may not be to scale, but usually employ more visuals. If you want to go to the Parliament buildings in London, you’ll see a picture of it. This is pretty simple, but very very helpful. I also have purchased less touristy maps, similar to what a local person may use (if they are still looking at paper maps). This kind of map is to scale and usually covers a wider area than a tourist map that concentrates on the city center and “old town.” After I’ve been to the city center four or five times, I’m likely to not return for a couple of weeks because I’m off exploring other parts of the city. 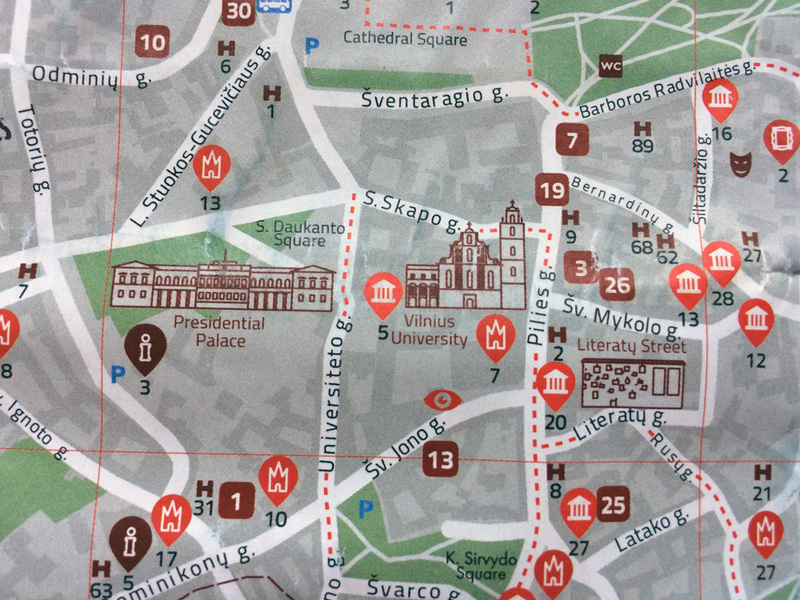 This great tourist map of Vilnius, Lithuania combines simple imagery with the map. All of this early exploration is important, not to mention fun. You need to establish where the center of town is and when you are moving away or toward it as a base. In later weeks, you may establish a few different centers. For instance, back to our Amsterdam grocery store, Albert Heijn, around the corner. That is also a jumping off point or a node. Do we go toward or away from Albert Heijn to get to Foodhallen? The number 3 tram toward the Rijksmuseum and De Pijp stops near the Albert Heijn. And for Morgan & Mees – I don’t even think about that landmark anymore, I can expertly arrive at my street from several directions now. I’ve truly been extremely fortunate to discover so many wonderful cities! Here are my mental maps, mistakes and all! Previous Post Map of the Month! Next Post How do I get there?